The Christianity that most of us are familiar with is layered over with hierarchical ritual and rules which often distant people from the very thing they look to religion to find. In recent times, social trappings have been added to create the illusion of the free flow of Spirit in return for allegiance. The truth is that Christianity was born at a crossroads of major spiritual/religious influences from around the world. If one has the patience to sort through the history and literature with a listening heart, rather than a chattering mind, the roots of all that spiritual wisdom can be found in the written records of the many, many people who have found the door to transcendence within the Christian faiths. This is not just a book about “saints”, a term which has come to have more to do with morality than spirituality. McColman includes the wisdom of the “heretics” as well. He asks readers to look past the limitations of individual people and understand the spiritual experience of the soul contained within the body. 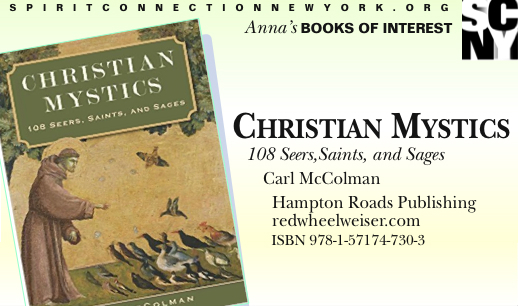 Written for people who want to encounter the mystics rather than study them, McColman encourages us to read the book devotionally rather than academically, allowing the Holy Spirit to enter our lives and transform us.